Other Products: Silver Pin, Lilac Ribbon, clasp, Hat Pattern, Cutting machine, glue gun. Instructions: Click here to view a larger photo of this project. Find the cut file for the hat here. Using white cardstock and Rhubarb Stalk ink, stamp the 1 large 1 medium and 1 small Oakberry Lane Blossoms. Using Majestic Violet ink, stamp 3 large, 1 medium and 1 small Oakberry Lane Blossoms. Die cut with coordinating dies. Color the center of the flowers with Buttercup ink and the petals with Majestic Violet ink. Place blossoms in the 3D mold, spray them lightly with water and place the lid on, run through the machine. Layer 2 blossoms together of the large and medium blossoms, creating 3 layered flowers. Make a hole in the center of the flowers and pull the stamens through. On the small flowers use only 1 bead stamen in the center of each flower. Stamp the small flower flourish from the Patchwork Daisy Border die with Tuxedo Black ink on white cardstock, color the flowers with Majestic Violet and the leaves with Leaf Green, die cut with the connected die. Cut the hat with paper from the paper Collection using your electronic die cutting machine and this https://www.silhouettedesignstore.com/view-shape/67665 cut file, reduce the size till you like it. Assemble the hat. 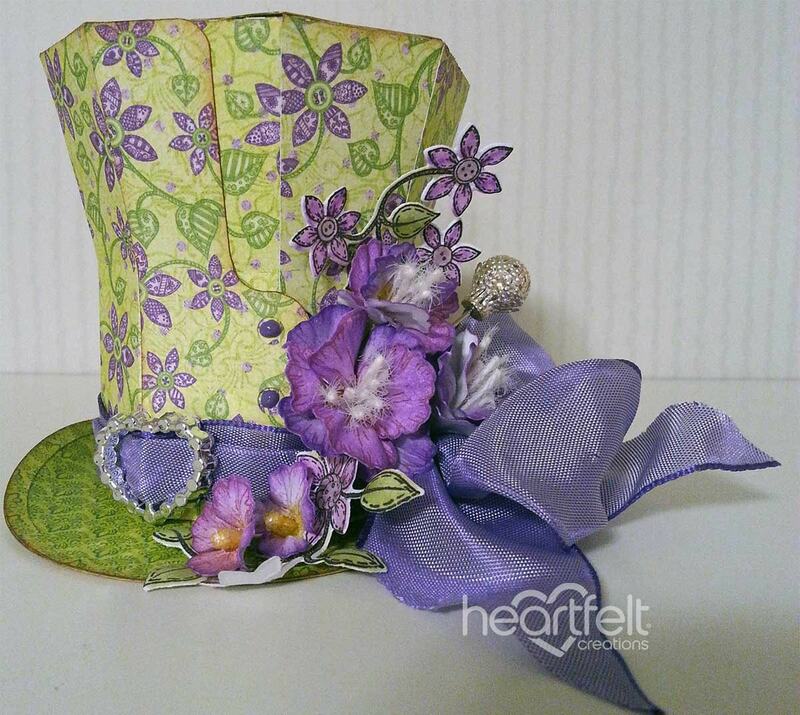 Then take the ribbon and the clasp and place along the bottom of the hat and create a nice bow. Cut the small flower flourish in half, and arrange flowers as shown. Finally add the silver pin.